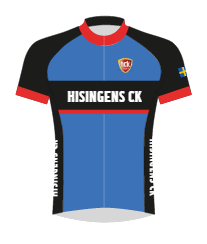 Hisingen’s Bicycle Club is collaborating with Bioracer to help us sell club clothes to our members via the webshop. The range of profiled products may vary slightly from year to year depending on our wishes and offerings from the supplier. In the webshop there may also be some products without HCK profiling. The club has a partnership that opens webshops for our members a few times a year. Thereafter delivery will be made to the Trek Bicycle Store on Övre Husargatan where clothing delivery takes place. With this handling you will also avoid shipping costs. We encourage and appreciate that our members cycle in our club clothes both in training and in other contexts. In order to cycle the Vättern Runt in one of the club’s groups, the least requirement for clothes is a club shirt. It also looks very nice when there is a group of cyclists dressed in HCK’s club clothes on our sports rounds. Feel free to advertise the club in our beautiful colors, but be aware that you represent Gothenburg’s nicest cycling club. By the way, it is good to have the right clothes on the bike ride due to weather and wind. We have the most that may be needed in clothing choices. Purchases are made when the Bioracer webshop is open. More information about the occasions and the webshop on the forum and facebook.